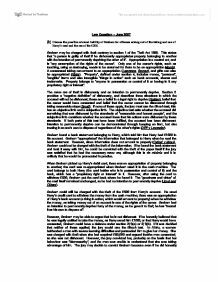 Law Question - June 2007 (b) Discuss the possible criminal liability of Graham for offences arising out of the taking and use of Harry's card and the use of the �200. Graham may be charged with theft contrary to section 1 of the Theft Act 1968. This states that "a person is guilty of theft if he dishonestly appropriates property belonging to another with the intention of permanently depriving the other of it". Appropriation is a neutral act, and is "any assumption of the rights of the owner". Only one of the owner's rights, such as touching, using or destroying, needs to be assumed for there to be an appropriation (Morris). A consensual taking can amount to an appropriation (Lawrence, Gomez), and gifts can also be appropriated (Hinks). "Property", defined under section 4, includes money, "personal", "tangible" items and also intangible "things in action" such as bank accounts, shares and trademarks. ...read more. 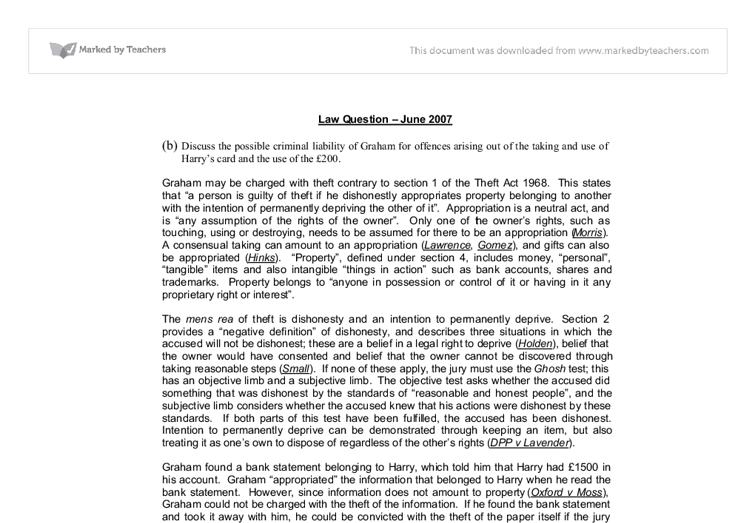 When Graham picked up Harry's debit card, there was an appropriation of property belonging to another; the card was re-appropriated when Graham used it in the cash machine. The card belongs to both Harry (the card holder who is in possession and control of it) and the bank, which has a "proprietary right or interest" in it. However, after using the card to withdraw �500, Graham put the card back where he found it. The "goodness and virtue" of the card itself remained unchanged, so he had no intention to permanently deprive (Lloyd and Others). Graham could still be charged with the theft of the �500 from Harry's account. He used Harry's credit card to withdraw the money from the cash machine; there was an appropriation of Harry's bank account (a thing in action, which would amount to property) when he withdrew the money, as taking money out of an account is one of the rights of the owner. ...read more. In this case, Graham's father "earmarked" the money and specified that it was a present for Graham's son, so Graham was under an obligation to deal with it in a particular way. Graham received the money "on account of" (on behalf of) his son, so the money will be regarded as belonging to his son. Graham appropriated the money when he picked it up; this would amount to property under section 4, and it belonged to Graham's son under section 5(3), so Graham has the actus reus of theft. He may have intended to permanently deprive his son of the money, as he gave it to Earl and treated it as his own to dispose of. Under section 2, none of the three defences apply, so the Ghosh test would be used. Graham gave away his son's present; this would be dishonest by the standards of "reasonable and honest people". If the jury was satisfied that Graham knew this was the case, he could be convicted of the theft of the �200.HoH ...read more. who got up, armed himself with a shot gun, and without warning fired three shots in to the dark. One of the shots killed a burgular. Convicted of murder. He appeal on the grounds of self defence, but it was rejected as the force was not reasonable. photographs of the marriage of Hollywood's celebrities Douglas and Catherine Zeta-Jones had been published without their authority by the popular magazine Hello!, the legal proceedings were between private parties, however all the Judges treated the Convention as relevant to the case because of the Human Rights Act 1998.
chance to take effect, she died of a heart attack which was not caused by the poison. So he was not liable for her death. Secondly the original injury arising from the defendants conduct must be more than a minimal cause of the result constituting the offence. to abuse their own wives than sons of nonviolent parents.According to Richard J. Gelles in his recent published book Domestic Violence Factoids he stated that domestic violence is the leading cause of injury to women between the ages of fifteen and forty-four in the United States. is an either/or situation. Furthermore, she causes Nina a loss by failing to disclose the information. Quince - fraud by abuse of position This is defined by section 4 of the Fraud Act 2006. This is rather broadly drafted offence.